San Francisco City Hall is lit up with the colors of the French flag after the terror attacks in Paris last year. UPDATE (Feb. 7, 12:22 p.m.): President Trump attacked the news media on Friday, Feb. 3, for supposedly underreporting acts of terrorism in Western countries. But, as this analysis from July of last year shows, attacks in the West are consistently overreported relative to similar attacks elsewhere. When a man drove a truck through a crowd in Nice, France, on Thursday night, the act of mass violence set off another all-too-familiar cycle of outrage, mourning and political gamesmanship. Media outlets ran stories of tragedy and heroism; politicians vowed to keep their constituents safe; citizens mourned at candlelight vigils. The attacks drew international attention, including in the U.S., where President Obama spoke from the White House, just as he had after November’s attacks in Paris. “We see our kids in the faces of the young people killed in Paris,” Obama said the following month. But this month has also seen attacks in Baghdad and Dhaka, Bangladesh, both of which Obama briefly mentioned in his address after the killings in Nice. Likewise, the attack in Paris was preceded by one in Beirut the day before. Yet those incidents received little attention — at least, until the subsequent attacks in France brought them into the spotlight — and the news media appeared to largely pass on covering these cities with the kind of live updates and in-depth human interest stories we saw after Paris and Nice. It’s not hard to understand why Americans care about France and worry when it’s in danger. Despite the intervening ocean, France feels close to home; our nations are politically, economically and culturally intertwined to the point of kinship. But the extensive coverage of the attacks in Nice and Paris force us to question the boundaries of this kinship: Do we not see our kids in the faces of the young people killed elsewhere? Of course, there are problems with drawing such a conclusion from a handful of examples. For one thing, each attack claims a different number of lives. Bazzi acknowledged this, adding that the sophistication and coordination of the Paris attacks lent itself more readily to intensive, minute-by-minute coverage. But he stood by his larger claim. Fortunately, we have the statistical tools to be more precise about Bazzi’s claim. After controlling for the number of injuries and fatalities, will we find that terrorist attacks on Western cities are more likely to be covered by the U.S. media than similar attacks elsewhere? The Rand Database of Worldwide Terrorism Incidents contains data on 40,129 terrorist attacks that took place from 1968 to 2009.1 Each incident is logged with a date, location, the number of injuries and fatalities, and a brief description of the attack, among other details. One piece of information that’s missing: Did we care? This is, admittedly, a blunt measure of news coverage; it would make no distinction between, say, Paris and Beirut, which were both covered by the Times. Bazzi’s critique focuses more on the nature of the coverage, the “sidebars and human features and profiles of the victims and all the associated stories” that the U.S. media published after the Paris attacks. 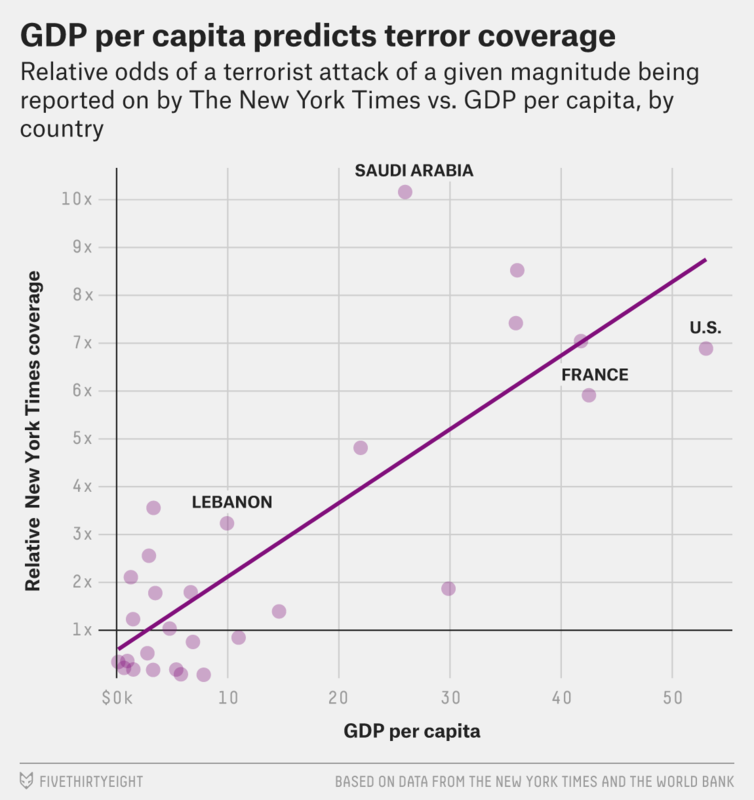 Still, if it’s true that we care less about terrorism in non-Western cities, we should find not only that major attacks receive less depth of coverage but also that minor attacks receive less coverage, period. My analysis homes in on this latter question: Does the location of an attack near the threshold of newsworthiness affect its coverage in U.S. media? Or at least, in The New York Times. I use the Times as a proxy for the U.S. news media because I was unable to find any other publication that makes its archives as accessible to researchers. I ran a logistic regression on this data, asking my computer to predict whether an attack was covered based only on (1) the number of injuries, (2) the number of fatalities and (3) the country where the attack took place. Sure enough, this third variable was — for some countries — a significant predictor of newsworthiness. We can estimate the relative likelihood of coverage for each country by calculating an “odds ratio.” For example, France’s odds ratio of 5.9 implies that an attack in France is 5.9 times as likely to be considered newsworthy as an attack of the same magnitude not in France. We shouldn’t read too much into the exact numbers, as the error bars are pretty wide.5 But the vast disparities, from 10.2 in Saudi Arabia to 0.1 in Colombia, cannot reasonably be blamed on statistical noise. Slackman’s skepticism is warranted. The term “terrorism,” which my analysis regards as a discrete category, is of course highly influenced by political context. Considering that the Rand database includes a variety of groups, from Colombian rebels to jihadists like al-Qaida, we have to be careful when considering these results. Indeed, Colombia’s claim to the lowest odds ratio of any country in this data set may be because of its longtime armed conflict. Terrorist attacks were quite frequent there during the period covered by the Rand data, and perhaps the regularity of these attacks made them less newsworthy in the eyes of the U.S. media. As Slackman suggests, we have to consider that the nature of attacks in a certain region — not just location — affects how that region is covered. As another example, Saudi Arabia has the highest odds ratio in the data set. Saudi Arabia is a key ally of the U.S., certainly, but another factor may be in play here: There is a history of anti-Western attacks in Saudi Arabia, many targeting Americans. When I controlled for the presence of the word “American” in Rand’s attack description, Saudi Arabia’s odds ratio dropped to 5.7. This indicates that the outsize coverage of Saudi Arabian attacks could have as much to do with who their victims are as where they took place. In addition to relevant country-specific contexts, Slackman is also right to be wary of the wide time span that this analysis covers.6 In particular, the political context for “terrorism” differs greatly for the periods before and after the Sept. 11 attacks; an attack taking place after Sept. 11, 2001, was 50 percent more likely to be covered by the Times than an attack of the same magnitude before Sept. 11.7 This could confound our results in countries where terrorism is concentrated on one side of the Sept. 11 attacks — for example, a shockingly small 22 of the 6,878 Iraqi attacks in the data set occurred before the 2003 U.S. invasion. We can’t reasonably conclude, then, that location affects coverage, all else held equal; in the complex world of international terrorism, it is not possible to hold all else equal. Bazzi, for his part, believes the disparities are in large part due to an empathy gap, fueled by audience interest just as much as reporter focus. “Editors and producers advance the argument that they’re satisfying the needs of their audience — especially now, when all traffic can be measured, coverage can be catered quite quickly,” Bazzi said. He also argued, though, that the audience doesn’t dictate the coverage focus so much as preserve an existing coverage focus that it has come to expect. “Why did the audience get this way?” he asked. In the meantime, what can consumers of U.S. news do to push for more equitable coverage? “It’s hard to impose habits on people,” Bazzi said. “One quick fix for the audience is to go to sources in those countries. … If they see things in those local sources that they think should have been done by their usual American outlets, then they should bring that up.” Being conscious of and vocal about discrepancies, pressing U.S. sources to improve by asking them to confront their place in the feedback loop, may be our best hope to break the cycle. Even with heightened scrutiny, though, this problem won’t resolve itself overnight. Slackman promised that the Times has “a deep and growing commitment to cover the world” — about this, I have no doubt. The paper has announced that it is making a $50 million investment in international coverage and distribution. But many readers are committed to seeking out equitable coverage, and still, peak Google search volume for “Beirut” fell short of 1 percent of the peak volume for “Paris” in the days following the attacks in those cities last year. The Rand Corp. is a nonprofit think tank located in the U.S. that does research for use in military planning. If its data has a systemic bias, I would expect it to be that its documentation of Western attacks is more comprehensive than that of non-Western attacks. This direction of bias, if it exists, strengthens the results of my analysis — my findings suggest that U.S. media coverage is more West-focused than Rand’s database. Rand’s database uses some “country” designations, like the West Bank/Gaza and Kashmir, that don’t match up exactly with United Nations-recognized boundaries. Because of the size of Rand’s database and query limits on the Times’s API, I first limited my data set to attacks that caused at least 10 injuries or at least one fatality. This reduced the sample size to 14,547. I then limited my analysis to countries that had at least 25 attacks in this database, at least one of which was covered by the Times. For each of these 31 countries, I ran a three-variable logistic regression with a dummy variable for that country. A single regression with 31 country-specific dummy variables would produce odds ratios comparing each country to a baseline of all countries that aren’t part of this analysis — an arbitrary reference point. Running 31 regressions, each with a single dummy variable, allows us to compare attacks in a country to attacks not in that country. The results of these two strategies, moreover, are nearly identical. For example, we can’t be sure that Saudi Arabia tops the list — we can only say with 95 percent confidence that Saudi Arabia’s odds ratio is between 4.2 and 24.8. Each point marked on the chart represents our “best guess” as to the true odds ratio, but there’s quite a bit of uncertainty. If we limit the analysis to only attacks that took place after Sept. 11, 2001, the main difference is that error bars are wider because the sample size is smaller. As a result, four countries (Pakistan, the West Bank/Gaza, France and Italy) slip out of statistical significance, and three more (Lebanon, Egypt and the U.K.) fall below the threshold for inclusion in this analysis. 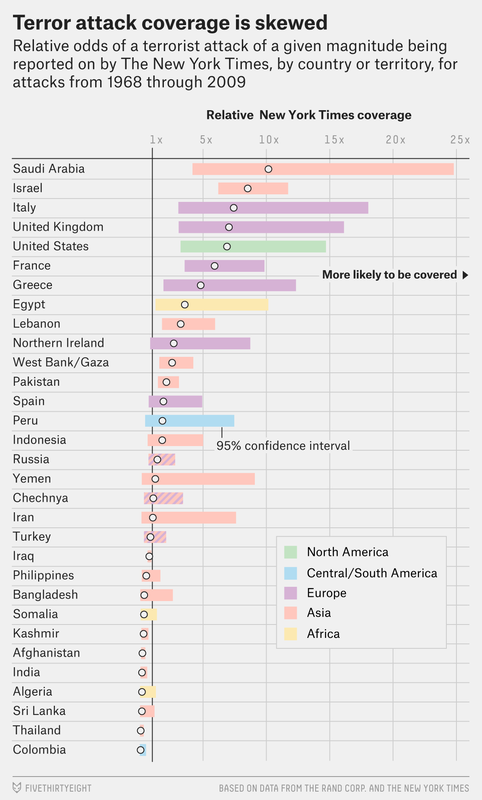 Somalia is the only country that becomes statistically significant; it joins the “significantly less coverage” category. This is true only after controlling for the country of the attack. Because of the increase in terrorism in Iraq and Afghanistan after Sept. 11, a given post-Sept. 11 attack was actually less likely to be covered than a pre-Sept. 11 attack of the same magnitude, but this likely has to do with the concentration of post-Sept. 11 attacks in lower-coverage areas. GDP per capita is the best single predictor of odds ratio I could find (r-squared = 0.64), although a number of other variables I tried — e.g., rarity of attacks, trade with the U.S., percentage of Sporcle users who remembered the country on a world map quiz — were also predictive.